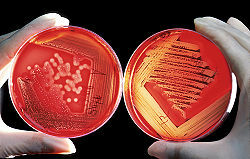 Scienteefic usage: A bluid agar plate used tae cultur bacteria an diagnose infection. Agar or agar-agar is a jelly-lik substance, obtained frae algae. It wis discovered in the late 1650s or early 1660s bi Mino Tarōzaemon in Japan, whaur it is cried kanten. ↑ Oxford Dictionary of English (2 ed.). 2005.